For quite a while I starved my skin of nourishing products, as I was convinced that if I used thicker products that my t-zone would become oily ( I was so wrong ) by starving your skin of vital nourishing ingredients, you can actually make your skin more combination/oily than if you were to just use a normal moisturising cream. The Moisture Rich Face Cream is absolutely beautiful, and it makes my skin feel so comfortable, nourished and bright. I also love the lightly floral scent, which makes it even nicer to use! some of the key ingredients Artic cloudberry (anti oxidant) and a selection of exquisite rose oils that leave the skin smooth and supple. The cream is quite thick, but is spreads evenly on the skin leaving a lovely silky soft base for your makeup. I'm fine with thick creams as long as they disappear relatively quickly without leaving any residue, and this cream does exactly that. I have been loving this cream for the transition from Winter to Spring, as it has kept my skin intensely hydrated throughout the varying weather we have had in the UK .. one minute its floods.. one minute its sunny haha! - I would recommend this for normal, combination and dry skin types, but if you are quite oily I would opt for the Balancing option, which I have previously used and liked too. Described as being Highly emollient yet super-absorbent this miracle oil has firmly embedded itself in my daily skincare routine. Key ingredients include Amazonian buriti nut oil, Roman chamomile, yarrow and benxoin which help to feed the skin with a replenishing blend of skin boosting and smoothing ingredients. If your skin is quite troublesome then the use of oil on oil is actually really balancing (it took me ages to get my head around this) but after trying it for myself, I must admit its true. The radiance facial oil is designed to be an extra boost of hydration, which can be applied before your day/night moisturiser or as a nourishing treatment by itself. Within a week I noticed my skin was a lot more even, smooth and brighter looking. It also sinks in really quickly, and I actually struggled to get a good swatch of it, as it starts sinking in straight away. The scent is very sophisticated and really quite relaxing, which makes it lovely to use as an overnight treatment, as well as an everyday boost. Balance me has proven itself to be a very impressive brand, as it offers the same high quality and luxury formulations of brands that cost over £30.00 per product. 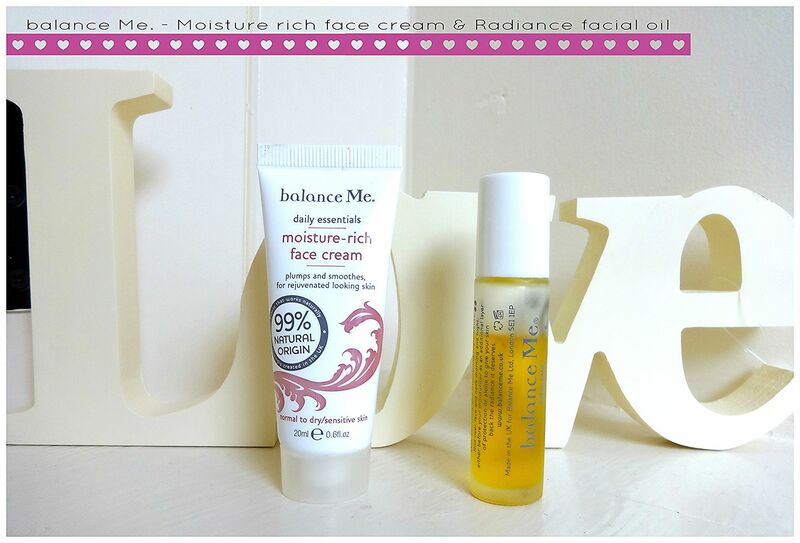 Balance me also offer three different sizes per product, which is great as obviously that alters the price you pay :) - I have really enjoyed using the two products mentioned in this post, and I'm pretty excited to try some more products from the brand. I would love to know what you thought of this post lovelies! and if you have any recommendations for me then don't forget to leave them in the comments section down below. I just reviewed this face oil! I love it. The face cream sounds lovely too. Great review, I only ever tried a lipbalm from Balance Me ages ago but I've read a lot of good reviews, it's a brand i'll look into. I love balance me products as well! All the ones I have tried have really impressed me! The facial oil is one of the best I've used. My favorite has to be the hydrating face mist though, it is amazing! I'm obsessed with this face oil - nothing even comes close to how good this is! Fab review, I'll have to try this out. The cleanser is super good...it leaves my skin feeling really fresh, I tried a sample and now have the urge to order some more.